Fresh from the Hudson Valley band’s upcoming LP. According to legend, and a few friends who wouldn't lie, Palm is a very good live band. Listening to "Ankles"—a rhythmically perverse, melodically convoluted song from the Hudson Valley band's new album—it's not hard to imagine why. There's a definite magnetism that comes with sidestepping conventions, which Palm does a lot here, with a hypnotizing energy. The track, premiering below, is ultimately full of so many clever turns that it's tough to imagine them ever playing it the same way twice. 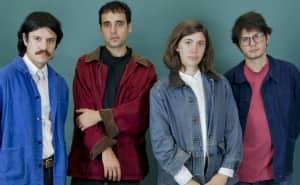 Guitarist Kasra Kurt suggests that at least some planning goes into making Palm's meandering rock songs, which are often free of easily digestible hooks. "We wrote 'Ankles' after recording the rest of the album," he told FADER over email. "Compositionally, it worked with some ideas that we’d been talking about a little, namely: stuttering, imperfect loops, working outside the confines of traditional rhythmic organization, and having the drums truly play lead." You can't plan for magic, though. "It wasn't worked out in advance," he added. The band's new full-length, Trading Basics, drops November 6th via Exploding in Sound and Inflated Records. "Ankles" also appears on a limited-edition cassette comp called The Colonel Presents - Eclectic Sessions alongside tracks by Show Me The Body, Guerrilla Toss, and more.